Total tropical activity for the season was near normal, with five named systems occurring within the area of responsibility of the Central Pacific Hurricane Center (CPHC). Three tropical cyclones (Alika, Ele, Huko) developed within the central Pacific, with two additional systems (Fausto, Lowell) moving into the area from the eastern Pacific. Ele and Huko went on to cross the Dateline into the western Pacific, where they became typhoons. The season was denoted by two relatively short but distinct "bursts" of activity. The first being toward the end of August when, for a 12 hour period, there were three active tropical cyclones in the central Pacific. The other "burst" occurred during the latter half of October. Outside of these times, no tropical cyclone activity was observed. With the exception of Fausto, the tropical systems developed in concert with periods in which the Inter-tropical Convergence Zone (ITCZ) became quite convectively active and took on a structure resembling that of a monsoonal trough. Such an occurrence is relatively common during an El Nino year when sea surface temperatures are warmer than normal. El Nino years also tend to result in tropical cyclone activity later into the season, and 2002 was no different. Tropical Storm Fausto, although weak, was the most unique system of the year. After entering the central Pacific and nearly dissipating, the low level remnant interacted with an upper level low to regenerate Fausto well north of Hawaii. This was only the second time on record that a tropical storm formed in that part of the Pacific. ** denotes information for only that portion of the storm's lifetime in the central north Pacific (CPHC's area of responsibility). Table entries are track forecast errors, measured in nautical miles. Values in parenthesis indicate the number of forecasts. Values in bold represent guidance forecast errors equal to or less than the official CPHC forecast. Table entries are errors in wind forecasts, measured in knots. Values in the parenthesis indicate the number of forecasts. Values in bold represent guidance forecast errors equal to or less than the official CPHC forecast. HISTORY. An area of convection that had persisted for a couple of days over 1000 nm southeast of Hawaii became Tropical Depression (TD) 1-C at 1800 UTC 22 August 2002 at 10.7N 142.7 W. TD 1-C drifted westward but remained fairly unorganized during the next 48 hours as sporadic bursts of convection occurred near the system. During 24 August, sustained convection developed closer to the center, and at 0000 UTC 25 August, TD 1-C became Tropical Storm Alika. 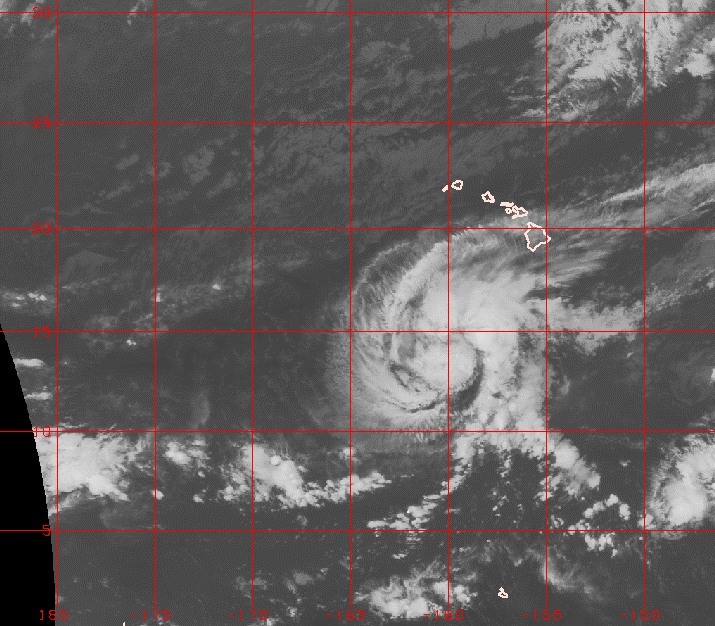 Within just six hours of becoming a tropical storm, Alika reached an intensity of 55 kt. After this point however, Alika began to slowly and steadily weaken. The main factor was increasing shear aloft, which was due to both upper level outflow from TD 2-C (Ele) and winds around an upper level low near Hawaii. By 0000 UTC 27 August, Alika had weakened to a tropical depression and just 30 hours later dissipated around 16 N, 169 W.
LOWER LEVELS. Alika formed along the western side of an active stretch of the Inter-tropical Convergence Zone, which extended along 10 N from 140 W eastward. Sea surface temperatures (SST) were between 28 and 29 Celsius. The east-west oriented subtropical ridge was 5 to 10 farther south than the climatological mean, and was located between 30 N and 25 N across the central Pacific throughout the lifetime of Alika. MIDDLE AND UPPER LEVELS. Alika formed south of a narrow mid to upper level ridge that was oriented from northeast to southwest, between the main Hawaiian Islands and the depression. As Alika moved towards the west at 10 to 15 knots (kt), it slowly intensified in this relatively low shear environment through 25 August. On 26 August the weather pattern began to change as a 200 millibars (mb) trough separated from the mid latitude westerlies to form a low 300 nautical miles (nm) northeast of Kauai. The northwest flow to the south of this low increased the vertical wind shear over Alika, and the system dissipated on 1200 UTC 28 August. The upper level outflow from the developing Tropical Storm Ele, centered only 300 nm west southwest of Alika, also played a role in Alika's demise. 23 / 0000 10.7 144.1 1009 30 "
23 / 0600 11.1 144.1 1009 30 "
23 / 1200 11.2 145.0 1007 30 "
23 / 1800 11.3 146.1 1007 30 "
24 / 0000 11.5 147.0 1007 30 "
24 / 0600 11.6 148.0 1007 30 "
24 / 1200 11.7 149.0 1007 30 "
24 / 1800 11.8 149.7 1003 30 "
25 / 0600 12.7 151.5 995 55 "
25 / 1200 12.8 152.6 998 50 "
25 / 1800 12.5 153.8 998 50 "
26 / 0000 12.5 155.1 998 50 "
26 / 0600 12.6 156.3 1000 45 "
26 / 1200 13.0 157.5 1000 45 "
26 / 1800 13.8 158.9 1004 35 "
27 / 0600 15.3 162.9 1009 30 "
27 / 1200 15.6 164.4 1010 30 "
27 / 1800 15.8 166.2 1009 25 "
28 / 0000 16.0 167.5 1009 25 "
Table entries are track forecast errors, measured in nautical miles. Values in parenthesis indicate the number of forecasts. Values in bold represent guidance forecast errors equal to or less than the official CPHC forecast. (**) refers to guidance with too few forecasts to make a comparison with. Table 3. Wind Verification Table entries are errors in wind forecasts, measured in knots. Values in the parenthesis indicate the number of forecasts. Values in bold represent guidance forecast errors equal to or less than the official CPHC forecast. (**) refers to guidance with too few forecasts to make a comparison with. Figure 2. Infrared satellite image of Alika taken 1100 UTC 25 August. Dots on the image are the initial and forecast positions from the most recent tropical cyclone forecast bulletin. Plotted values are the maximum winds (above dot) and position valid date/time (below dot). HISTORY. Tropical Depression 2-C formed at 0000 UTC 27 August from a persistent area of convection, about 1000 nm southwest of Honolulu, that marked the eastern extension of the monsoon trough. TD 2-C was classified as Tropical Storm Ele just six hours later. Despite the presence of Tropical Storm Alika only several hundred miles to the northeast, Ele continued to quickly develop and within 24 hours reached hurricane strength while at the same time, aiding in the demise of Alika. Hurricane Ele continued to intensify as it moved west then northwestward. Shortly after 0000 UTC 30 August, Ele crossed the dateline and moved out of the CPHC's area of responsibility. As it did so, Ele had sustained winds estimated at 110 kt, making it a strong Category 3 on the Saffir-Simpson scale and by far the most intense tropical cyclone in the central north Pacific during 2002. LOWER LEVELS. Ele formed at the eastern end of the anomalously strong and eastward displaced monsoon trough. In addition, sea surface temperatures (SSTs) were between 29 and 30 degrees Celsius. During Ele's development, the east-west oriented subtropical ridge was located between 30 N and 25 N . This pattern changed somewhat as Ele approached the dateline. A ridge extended southwestward to about 30 N 165 W from a high centered far northeast of Hawaii while a cold front approached 30N well to the northwest. This resulted in a synoptic southeasterly low level flow around Ele. MIDDLE AND UPPER LEVELS. Ele formed in deep easterly flow south of a mid to upper level ridge. As Ele moved west and around the periphery of the ridge, the steering flow turned southeast and resulted in Ele taking on a more northwestward path. Additionally, an upper tropospheric low approximately 300 nm northwest of Kauai enhanced upper level outflow on the eastern side of Ele which aided in the rapid intensification of the storm. 27 / 1200 10.0 170.9 990 60 "
27 / 1800 10.1 172.0 990 60 "
28 / 0600 10.0 174.4 987 65 "
28 / 1200 10.3 175.3 984 75 "
28 / 1800 10.5 176.4 983 75 "
29 / 0000 10.7 177.5 981 75 "
29 / 0600 10.9 178.0 976 90 "
29 / 1200 11.2 178.4 976 90 "
29 / 1800 11.7 179.2 970 100 "
30 / 0000 12.1 179.9 945 110 "
Table entries are errors in wind forecasts, measured in knots. Values in the parenthesis indicate the number of forecasts. Values in bold represent guidance forecast errors equal to or less than the official CPHC forecast. (**) refers to guidance with too few forecasts to make a comparison with. Figure 2. Infrared satellite image of Ele taken at 0630 UTC 28 October. Dots on the image are the initial and forecast positions from the most recent tropical cyclone forecast bulletin. Plotted values are the maximum winds (above dot) and position valid date/time (below dot). HISTORY. Fausto was a relatively long-lived system that developed and briefly achieved Category 4 status in the Eastern Pacific before crossing into the Central Pacific as a weakening tropical storm. During it's lifetime in the Central Pacific, Fausto nearly dissipated before being "reborn" and briefly regaining tropical storm strength. Tropical Depression 8-E developed at 1200 UTC 21 August in the Eastern Pacific, about 400 nm south-southwest of Manzanillo, Mexico. 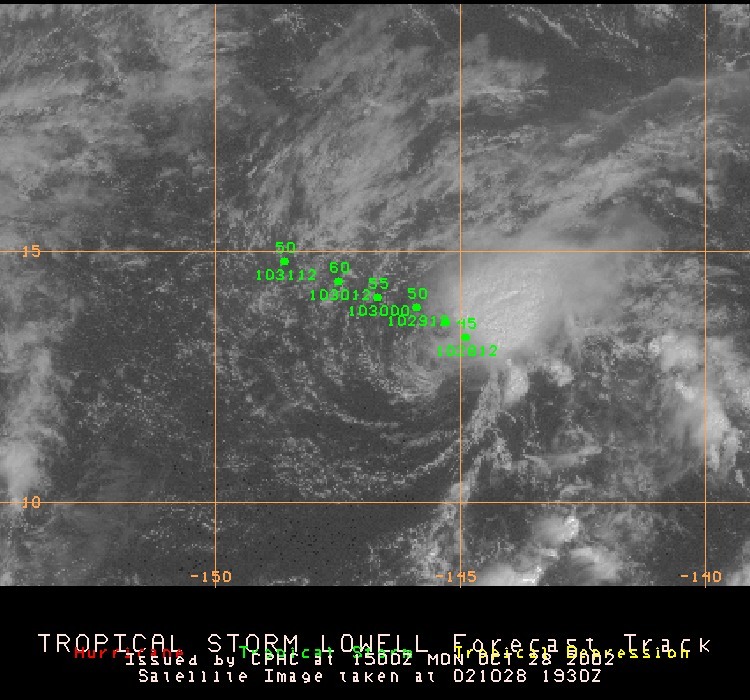 The system quickly strengthened, becoming Tropical Storm Fausto at 0000 UTC 22 August. Fausto moved west-northwestward and achieved hurricane strength just 18 hours later. It ultimately reached a peak intensity of 125 kt at 1200 UTC 24 August. After that point, Fausto steadily weakened, becoming a tropical storm by 1200 UTC 26 August. Fausto crossed 140 W longitude and entered the central Pacific basin shortly after 1800 UTC 27 August as a minimal tropical storm. With no deep convection existing to help sustain the circulation, Fausto became a tropical depression by 0000 UTC 28 August and just 12 hours later, was classified a remnant low. The remnant low of Fausto continued on a westward track, passing about 430 n mi north of the Hawaiian Islands on 30 August. By that time, Fausto's remnants were interacting with a tropical upper-tropospheric trough (TUTT) cell (upper level low), resulting in the redevelopment of deep convection. This in turn caused Fausto to intensify. 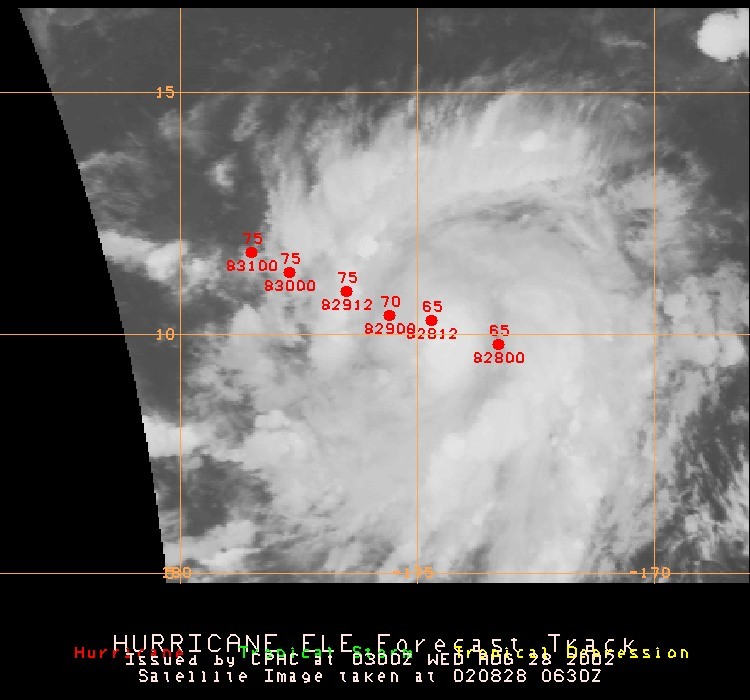 Re-analysis of QuickScat and satellite data suggests that organization was sufficient to once again classify Fausto as a tropical depression at 1800 UTC 30 August while it was roughly 550 nm north of Oahu. Fausto returned to a west-northwest track and slowly strengthened. By 1800 UTC 1 September, Fausto again achieved tropical storm status, although it was a small storm as tropical storm force winds likely did not extend further than 50 nm from the center. This "rebirth" was short-lived, however, as a mid-latitude frontal system approached from the west on 2 September and resulted in Fausto turning to a more northward path and accelerating. 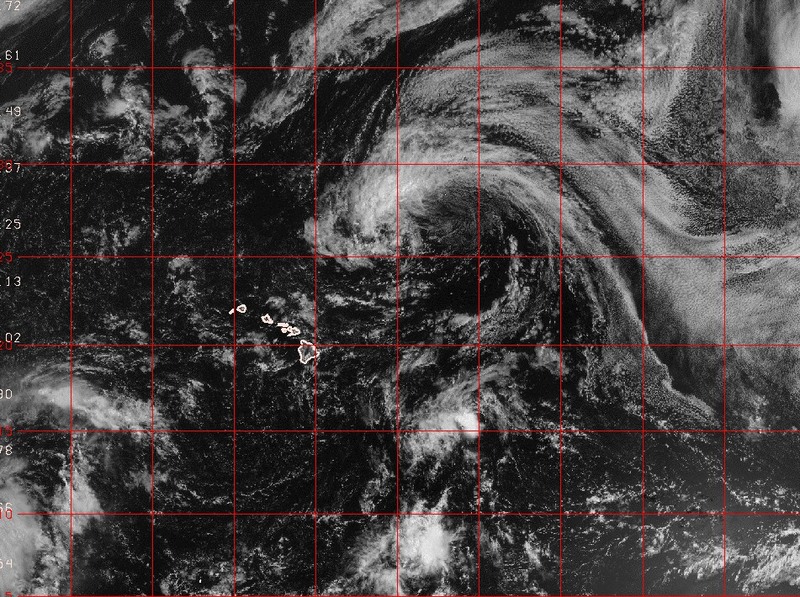 Shortly after 0000 UTC on 3 September, Fausto became absorbed by the much larger mid-latitude system, and it's remnants moved across the central Aleutians shortly thereafter. Tropical cyclone formation north of the Hawaiian Islands is very rare. The last documented case was in 1975 (Cochran, 1976) and appears to be a remarkably similar scenario to that which occurred with Fausto. In this case, the remnant low level circulation of an Eastern Pacific hurricane, Ilsa, interacted with an upper level low resulting in the rapid re-development of the circulation which ultimately appears to have reached minimal hurricane strength around 40 N. The only apparent difference with the 1975 case is that convection was already associated with the upper level low before Ilsa's circulation interacted with it. LOWER LEVELS. As Fausto entered the Central Pacific and moved north of the Hawaiian Islands, it was southwest of a 1028 mb subtropical high centered near 36 N 137 W and embedded within low level east-southeast flow. As the remnants of Fausto continued to move westward, SSTs began to increase due in part to a large area of anomalously (~1C) warm water that was in place across the central North Pacific. This, in combination with a conducive upper level pattern, resulted in convective development and the regeneration of Fausto on 1 September. Fausto began to increase in forward speed and track more northwestward and ultimately northward on 2 September as it became increasingly influenced by and then absorbed into a mid-latitude frontal system near the Dateline. MIDDLE AND UPPER LEVELS. At the time Fausto entered the Central Pacific on 27 August, it was located well south of a large scale mid level ridge, however a nearly stationary TUTT cell was located near 27 N 148 W. This TUTT cell was responsible for strong (30-50 kt) upper level southwest winds that had been impacting and shearing Fausto apart as it approached. Water vapor imagery indicated that during the period 28-29 August, increasing amounts of moisture, mostly at upper levels, were being entrained into the TUTT cell. By 0000 UTC 30 August, the low level remnants of Fausto were located underneath the TUTT cell, and together both systems began to move west-northwest around the deep layer ridge of high pressure in place to the northeast. With Fausto's remnants underneath the center of the upper low, an area of weak shear, and over warmer SSTs, conditions were favorable for convective development. As convection developed, the upper level low quickly dissipated. During 1 September, the mid-latitude trough began approaching from the west, resulting in the development of a deeper southerly flow around Fausto. That flow strengthened as the mid-latitude trough reached the Dateline on 2 September, with Fausto battling a 30-40 kt southerly jet aloft. This was too much for Fausto to maintain a circulation, and by 0600 UTC 3 September it was declared to have been absorbed into the large extra-tropical system. Cochran, D., 1976: Picture of the Month. Unusual Tropical Development from a Mid-Pacific Cold Low. Mon. Wea. Rev., 104, 804-808. 28 / 0600 26.3 142.8 1010 30 "
28 / 1800 27.0 147.0 1012 30 "
29 / 0000 27.3 149.2 1012 25 "
29 / 0600 27.5 151.3 1012 25 "
29 / 1200 27.8 153.3 1013 25 "
29 / 1800 27.9 154.7 1013 25 "
30 / 0000 28.1 155.4 1012 30 "
30 / 0600 28.6 156.1 1012 30 "
30 / 1200 29.3 156.7 1012 30 "
31 / 0000 30.9 158.0 1012 30 "
31 / 0600 31.9 159.0 1012 30 "
31 / 1200 32.4 160.5 1012 30 "
31 / 1800 32.9 162.3 1010 30 "
01 / 0000 33.3 163.8 1009 30 "
01 / 0600 33.8 165.0 1009 30 "
01 / 1200 34.3 166.3 1009 30 "
02 / 0000 35.1 168.4 1009 35 "
02 / 0600 35.7 169.2 1009 35 "
02 / 1200 37.2 170.0 1011 35 "
02 / 1800 40.0 170.3 1014 35 "
03 / 0000 43.1 169.8 1016 35 "
Figure 1. Best Track Plot. Figure 2. Visible Satellite Picture of Tropical Storm Fausto at 2000 UTC 28 August. HISTORY. Huko was a typical El-Niño storm forming in the tropics south of the Hawaiian Islands relatively late in the season. It formed from a persistent cluster of convection which was within an active monsoonal trough stretching eastward roughly along 10 N from about 160 W to near Mexico. During 24 October, convection rapidly increased and consolidated such that at 1800 UTC, CPHC forecasters classified the system as TD 3-C.
TD 3-C drifted northward initially while getting better organized. It attained Tropical Storm strength near 11N 155W at 0000 UTC 26 October and was given the Hawaiian name Huko. Huko now turned on a more northwesterly course while continuing to intensify. At 1800 UTC 28 October it was classified as a Hurricane near 13 N 160 W.
At this time, Tropical Storm Lowell was less than 900 miles east of Huko, and close enough for some interaction between the systems. This interaction, combined with a slight increase in shear aloft resulted in a slight weakening of Huko on 30 October. Huko then took on a more westward course near 14N and about 10 kt forward speed. Huko regained hurricane strength on 31 October as it moved over 120 nm south of Johnston Island resulting in nothing more than wind gusts of about 25 kt on that tiny atoll. Late on 2 November, Huko began accelerating westward as it passed south of a strong migratory high pressure cell. Huko crossed the International Date Line, becoming a typhoon and moving out of CPHC's area of responsibility at 0600 UTC 3 November. Ultimately Huko recurved near 160E and transitioned to an extra-tropical system before moving again across the dateline to the south of Midway Island on 9 November. LOW LEVELS. Huko developed from an active monsoonal trough located along 10N and remained well south of the subtropical ridge which was entrenched between 25N and 30N. MIDDLE AND UPPER LEVELS. For much of Huko's lifetime in the Central Pacific, a deep layer ridge of high pressure remained north of the system resulting in a steering flow that kept Huko on a general westward track. Water vapor imagery did indicate the presence of an upper level low west of Huko during 27-29 October which resulted in increased shear aloft over Huko. This in turn resulted in a temporary weakening of Huko below hurricane strength. By 30 October, this weak upper low had dissipated. 25 / 0000 9.8 154.3 1007 25 "
25 / 0600 10.0 154.2 1007 25 "
25 / 1200 10.3 154.2 1006 25 "
25 / 1800 10.6 154.6 1005 30 "
26 / 0600 11.4 155.1 1005 35 "
26 / 1200 11.4 155.7 1009 40 "
26 / 1800 11.5 156.3 1006 45 "
27 / 0000 11.5 156.8 1000 45 "
27 / 0600 11.7 157.6 997 50 "
27 / 1200 11.9 157.9 994 55 "
27 / 1800 12.2 158.1 994 55 "
28 / 0000 12.3 158.5 994 55 "
28 / 0600 12.5 158.8 994 55 "
28 / 1200 12.7 159.0 993 60 "
29 / 0000 12.8 159.7 987 65 "
29 / 0600 12.9 160.0 987 65 "
29 / 1200 13.2 160.3 987 65 "
29 / 1800 13.6 160.4 987 65 "
30 / 0600 14.0 162.6 996 55 "
30 / 1200 13.8 163.4 998 50 "
30 / 1800 13.7 164.3 998 55 "
31 / 0000 13.9 165.3 998 60 "
31 / 1200 13.7 166.9 987 65 "
31 / 1800 13.5 168.1 987 65 "
01 / 0000 13.4 169.2 990 65 "
01 / 0600 13.7 170.3 987 65 "
01 / 1200 14.1 171.4 981 75 "
01 / 1800 14.6 172.0 980 75 "
02 / 0000 14.7 172.6 981 75 "
02 / 0600 14.7 173.5 980 75 "
02 / 1200 14.8 174.2 980 75 "
02 / 1800 15.0 175.2 981 75 "
03 / 0000 15.4 176.6 981 75 "
03 / 0600 15.7 179.1 981 75 "
Table entries are errors in wind forecast, measured in knots. Values in the parenthesis indicate the number of forecasts. Values in bold represent guidance forecast errors equal to or less than the official CPHC forecast. (**) refers to guidance with too few forecasts to make a comparison with. Figure 2. Infrared satellite image of Hurricane Huko taken 1530 UTC 29 October 2002. HISTORY. Lowell developed in the eastern Pacific on 22 October around 11 N 130.5 W, and reached tropical storm strength on 23 October. It remained a tropical storm for 36 hours and then weakened back to a tropical depression as it encountered strong shear aloft. TD Lowell moved steadily westward and moved into CPHC's area of responsibility around 1800 UTC October 25. On 27 October, with upper level shear diminishing, Lowell intensified and once more became a minimal tropical storm. Embedded within a rather weak steering flow, Lowell drifted northwest for roughly 24 hours while achieving it's maximum intensity with estimated 45 kt sustained winds. By 29 October, the close proximity of Huko caused a rapid decline of Lowell to the tropical depression stage. With Lowell devoid of much deep convection, it began drifting southwestward in response to the low-level steering flow. Lowell finally dissipated on 31 October. LOWER LEVELS. During it's time in the central Pacific, Lowell remained well south of the subtropical ridge and was within an active monsoonal trough region. Sea surface temperatures were near to slightly above normal and were around 28C. MIDDLE AND UPPER LEVELS. Shortly after entering the central Pacific, a deep layer ridge became established to the north of Lowell and allowed for re-intensification. However, by 29 October, strong upper level outflow and subsidence around now Hurricane Huko resulted in Lowell again weakening and ultimately dissipating. 26 / 0000 12.7 140.5 1009 30 "
26 / 0600 12.8 141.2 1009 30 "
26 / 1200 13.0 142.0 1009 30 "
26 / 1800 12.5 143.0 1009 30 "
27 / 0000 12.3 143.7 1009 30 "
27 / 0600 12.3 143.9 1008 30 "
27 / 1200 12.5 144.0 1009 30 "
28 / 0000 13.1 144.5 1009 35 "
28 / 0600 13.2 144.7 1004 40 "
28 / 1200 13.3 144.9 1002 45 "
28 / 1800 12.9 145.4 1002 45 "
29 / 0000 12.7 145.8 1004 40 "
29 / 0600 12.6 146.3 1005 35 "
29 / 1800 12.0 147.6 1009 25 "
30 / 0000 12.1 148.3 1009 25 "
30 / 0600 11.9 148.7 1009 25 "
30 / 1200 11.7 148.9 1009 25 "
30 / 1800 11.5 149.1 1009 25 "
Figure 2. Visible satellite image of Lowell taken at 1930 UTC 28 October. Dots on the image are the initial and forecast positions from the most recent tropical cyclone forecast bulletin. Plotted values are the maximum winds (above dot) and position valid date/time (below dot). Track Verification: Errors are given in nm. #F refers to the number of forecasts available for the verification. Values in bold type are those that the model guidance averaged better verification than the CPHC forecast. Intensity Verification: Errors are in kts. #F refers to the number of forecasts available for the verification. Values highlighted in red are those that the model guidance averaged better verification than the CPHC forecast. Note lack of data for 120 hr forecasts for the SHF5 guidance. CPHC performed better than guidance for the most part. Ele was the exception, and CPHC posted the poorest verification of the 5 storms. With this storm, all but the AVNO guidance beat CPHC at nearly all forecast periods. In fact, the CPHC intensity error at 72hrs was 59kts, while GFDL had a 9kt error at 72hrs and SHIP & SHFR guidance were in the 30-35 kt error range. CPHC verification versus guidance was a little more mixed. Alika and to some extent Ele proved to be most difficult for CPHC forecasters. 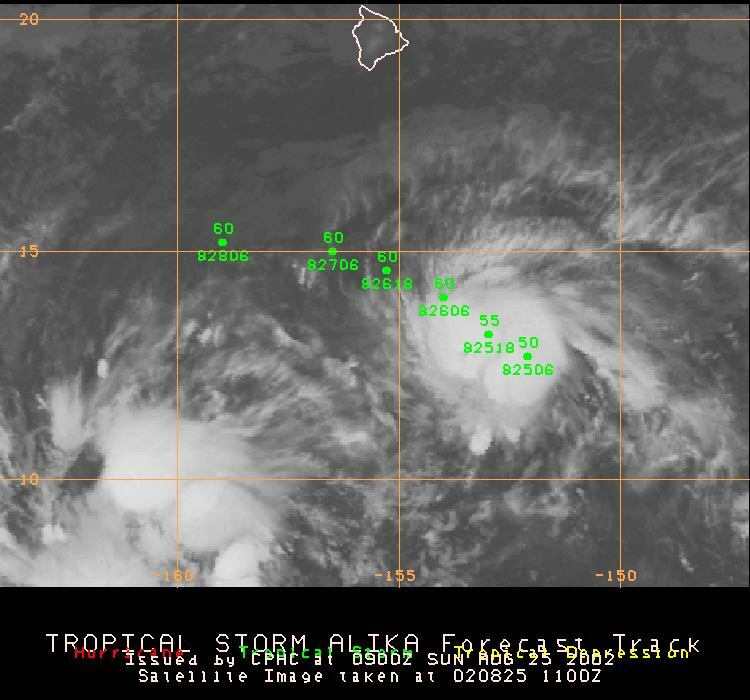 Part of the apparent problem with Alika, other than it being the first system of the season, was that Ele formed west of Alika and model guidance, although indicating Ele's eventual development, also "got confused" and considered the "Ele-to-be" system to be Alika and as a result indicated rapid westward motion. Lowell also presented a challenge with respect to the track forecast, part in it's slower than anticipated "demise" and also due to some slow erratic motion at times. Read tropical preparedness hints. See the distance from any active system from Hawaii locations.